Reader Question: I have heard that you can use mineral spirits with colored pencils to break it down and make a kind of wash, which gives the affect of a water color. This would be for skies, or for skin shading. Is this true? Hi Pattie! Yes, it is possible to use mineral spirits with colored pencils to achieve certain blending effects. When you paint a wash of mineral spirits over your colored pencil drawing, it blends the colored pencil pigment into a smooth, paint-like appearance. If you want to try it, I would recommend using odorless mineral spirits such as Gamblin Gamsol Odorless Mineral Spirits or Crown Low Odor Mineral Spirits. 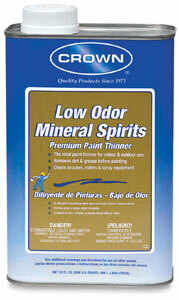 Even though these mineral spirits are odorless, they should still be used with caution in a well-ventilated area. A small amount of mineral spirits will go a long way when brushed onto a colored pencil drawing. Depending on the size of the area that you want to wash, you should use a relatively small brush (pointed or round for detailed areas, and flat for broad areas). You could also use a Q-tip. You only need to pour a very small amount of mineral spirits into a cup - enough to cover the bottom of the cup and then some. If you need more, you can pour more, but if you want to be economical, then start off with as little as possible. You can apply mineral spirit washes at nearly every stage of the colored pencil drawing process - after applying the "underdrawing", after building up several layers, or as a final touch-up. After the wash dries, you can draw more detail and colors over top of the washed area, and continue to add washes if and when you feel like it. Hope that helps & have fun with it!